There have been at least 950 collisions involving pedestrians on Winnipeg's roads since 2009, according to data from Manitoba Public Insurance analyzed by CBC. And in 2016 alone, five collisions involving pedestrians were fatal. There have been at least 950 collisions involving pedestrians on Winnipeg's roads since 2009, according to data from Manitoba Public Insurance analyzed by CBC. And in 2016 alone, five collisions involving pedestrians were fatal. A 68-year-old woman was the latest person to be killed after a collision on Sunday at Kimberly Avenue and Henderson Highway in East Kildonan. "It can be scary at times, if you are at a busy time of day, like I usually am," said Darren Anderson on Wednesday while walking home through the area. "There's lots of traffic coming from every direction. It's not always the safest. You have to be pretty careful." And that intersection isn't even the worst place to cross the street along Henderson Highway. That dubious distinction lands a few blocks north at Henderson and McLeod Avenue. That intersection ranked among the 13 intersections where pedestrians had most often been hit by a vehicle between 2009 and 2014, according to MPI's data. 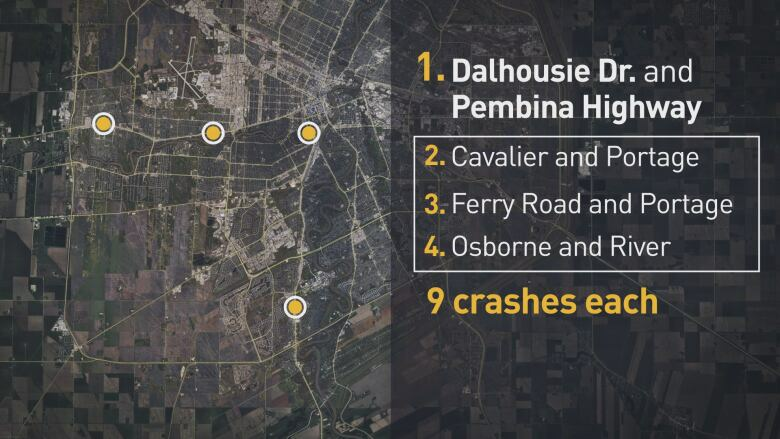 The title of worst intersection for pedestrians goes to the corner of Dalhousie Drive and Pembina Highway, according to the data. There were 10 collisions at the intersection involving pedestrians from 2009 to 2014, including one which was fatal. Three other intersections share the second-place title with nine collisions involving pedestrians in the same time period: Cavalier Drive and Portage Avenue, Ferry Road and Portage Avenue, and Osborne Street and River Avenue. The four worst Winnipeg intersections for collisions involving pedestrians from 2009 to 2014, according to MPI data. On average, there are 190 pedestrian intersection accidents per year in Winnipeg, according to MPI. At Kimberly Avenue and Henderson there were two from 2009 to 2014. However, the number of fatal collisions is dropping, according to Winnipeg Police. Ten pedestrians died following collisions in 2010, but that number has been dropping — with six in 2015 and five so far this year. While the number may be declining, Const. Jason Michalyshen said vehicle-related deaths — whether it's pedestrians or other collisions — are "way too high." "We want everyone to be mindful that we are all sharing the road and we need to be careful there," he said on Wednesday.